Babblings of a Mommy: Update Your Fall Wardrobe With Bonmarché. Update Your Fall Wardrobe With Bonmarché. Plus size clothing has come a long way in recent years. Long gone are the days when having a voluptuous figure meant dressing in your Nana's moo-moos. Now stores like Bonmarché offer stylish easy to wear pieces for full-sized women! Bonmarché is the UK's largest value retailer selling affordable quality womenswear in a wide range of sizes (12-24) to women over 45 years. Ranges include casual and formal separates, outerwear, swimwear, lingerie nightwear and accessories, all designed with a more full-sized figure in mind. 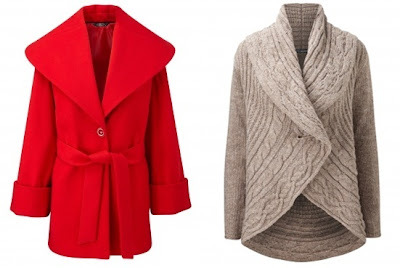 This fall, look to update your wardrobe with plus size women's clothing from Bonmarché, who offers simple yet stylish pieces, like this gorgeous Shawl Collar Belted Coat, or this warm David Emanuel Circular Knit Cardigan. You might remember David Emanuel as the designer who famously co-designed Princess Diana's amazing one-of-a-kind wedding dress in 1981! But since 2007 he has been designing affordable clothes for real women with his collaboration with Bonmarché. Their choice of colors, fabrics and styles for the season means there is something for everyone - from knitwear to tailored trousers and everything in between. With styles that take you back to 60's innocence with chunky knits and 40's nostalgia featuring their much loved shift dresses, there is plenty to inspire your new look! At Bomarché they believe in providing everything a modern woman might want to update her wardrobe, at prices that won't break the bank--and you can't argue with that!